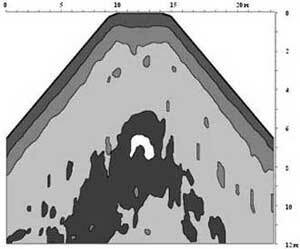 Geo-Radar.ru - GPR cross-section of the burial mound "The burial mound alley"
GPR cross-section of the burial mound "The burial mound alley", Fanagoriya south necropolis, Sennoy settlement, Krasnodar region. 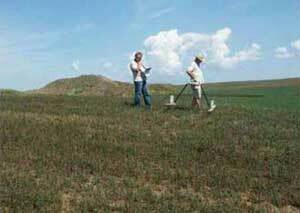 GPR investigation was made for Fanagoriya detachment of Tamanskaya expedition of the Institute of archaeology RAS. 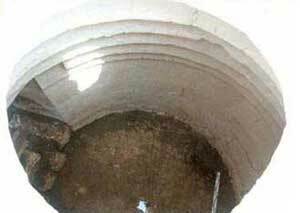 "The object" in the centre of the burial mound in the " burial mound alley" was excavated by Fanagoriya detachment of the Institute of archaeology RAS in 2003 season. Stone crypt in the burial mound was built in the 4 th century B.C. (as the specialists supposed) by ancient Greeks, had been living on the coast of Tamanskiy bay. This burial mound is a part of Fanagoriya necropolis. The crypt has a unique construction being rarely found. On the top figure - vaulted (with steps) crypt's vault. 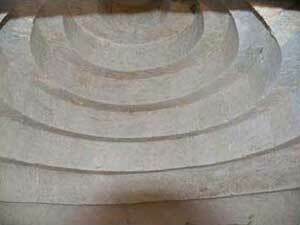 On the bottom figure on the right - from above view of the crypt in whole. 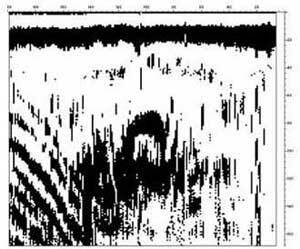 On the bottom figure on the left - working process of GPR investigation.